10" x 10" x .5"
Quote: "I refresh my soul in the woods so quiet, in the cool sweet sound of the pine. And the cares of life evanesce with the night midst the trees I deem sublime"
The quote in this piece is written by my grandfather’s uncle, Frank W. Hooper. He has a book called Sidewalk Sermons that includes his poetry. He wrote it in 1964. 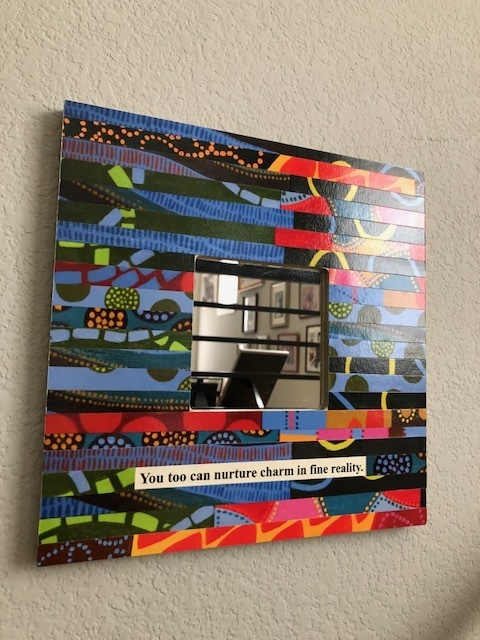 Each quote I have chosen to use with my art resonated with me and I hope resonates with the view as they look into the mirror and connect with the words and themselves. Quote: "Think tall. Stand tall. Talk tall. Live tall. BE TALL." Quote: "Utopia comes to those who do and dare." The quote in this piece is written by my grandfather’s great uncle, Frank W. Hooper. He has a book called Sidewalk Sermons that includes his poetry. He wrote it in 1964. 10″ x 10″ x .5"
Quote: "View a rainbow mist." Quote: "You too can nurture charm in fine reality." A kind Austin couple loved the quote, "You too can nurture charm in fine reality" and wanted the color scheme of the piece, I am Tall. Here is an example of possibilities!